As we’ve mentioned in the last few posts, this year we are only investigating modern deposits associated with the rebuilding of the Abbey. However, these works have disturbed earlier deposits, bringing some finds from earlier periods into these later layers. The most exciting of these finds is a small, beautifully modelled bronze pin. This dates to the 7th century, and is of a type known as a nail-headed pin. The nail-headed pin found at Iona Abbey. This type of pin was manufactured widely in early medieval Scotland at sites such as Dunadd, the royal inauguration site of the kings of Dál Riata. Most of these pins are fairly undistinguished, utilitarian items. The one we’ve found, however, is beautifully crafted with a hip shank, in which the shaft is slightly wider in the middle to help keep it securely fastened to hair or clothing. There is a very similar example from Buiston Crannog in Ayrshire, which dates to the 7th century AD, but ours on Iona is smaller. We don’t know whether this pin was worn by a man, woman, or child. Christian burials from this period generally do not have any grave goods in them, so we do not know as much about typical styles of dress as in other areas of Britain. From left to right: Adrián Maldonado, Judy Russell, Cecilia Russell, and Ewan Campbell. We have met a large number of people over the last two weeks, but an especial treat on Saturday a visit by Judy and Cecilia Russell. The Russell family have been associated with Iona for over a century, and Judy and Cecilia’s grandfather gave generously to and was greatly supportive of the reconstruction of the Abbey in the early 20th century and particularly the renovations carried out by the Iona Community from 1938 onwards. 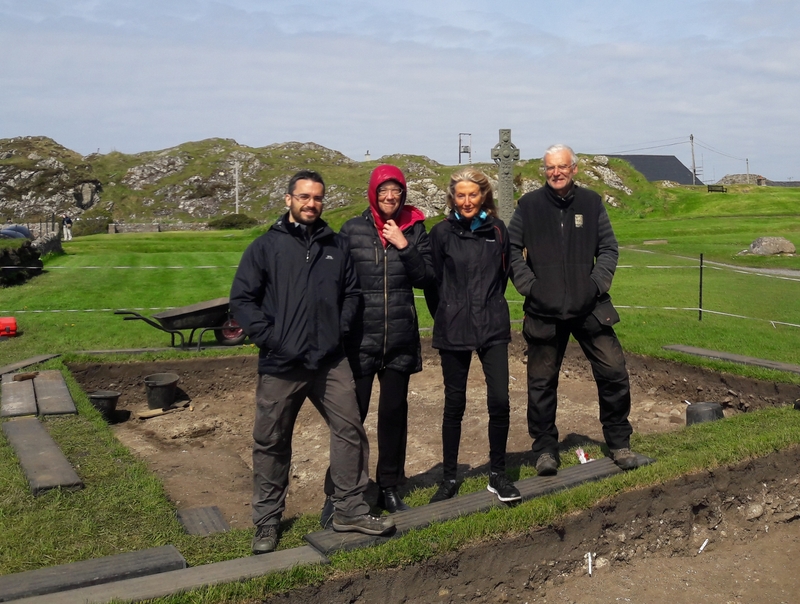 Particularly relevant to our excavations, their father sponsored the series of excavations on Iona by both Charles Thomas and Richard Reece from the 1950s to 1980s, without which our own excavations would not have occurred. It was wonderful to hear Judy and Cecilia’s first-hand reminiscences of these groundbreaking excavations! If you happen to be in the area, we are excavating until the end of this week. Feel free to stop by and say hello!